Hotel Taj West End Bangalore, Taj West End Hotel Bangalore, Reservation for Hotel Taj West End, Bangalore, India. Azddress: Race Course Road, Bangalore- 560001, Karnataka, India. Accessibility: 11.5 kms. from Bangalore Airport; 2 kms. from Bangalore Railway Station; 2 kms. from Bus Stand. Hotel Taj West End is situated near the city centre, spread over 20 acres of landscaped gardens - a tribute to garden city Bangalore. It is most unique 5-star deluxe hotel, close to the business, entertainment, and shopping districts, near to the race course, golf course and the planetarium. 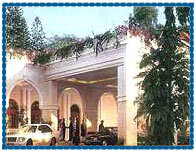 Hotel offers a warm hospitality with an aura of understated elegance. 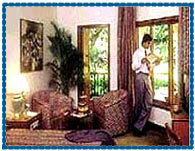 Hotel offers 129 centrally air-conditioned rooms including 11 suites. All the rooms are sleek and stylish providing luxurious comfort and excellent amenities like in-room fax, Internet connectivity, 2-line speakerphone with international direct dial facility, mini bar, personal safe, channel music, television with satellite programs. Broadband Internet Access, In-house Video-conferencing, Laptop Computers on Hire, Mobile Phones on Hire, Portable Printers on Hire, Secretarial Services, Translation / Interpretation Services, Wireless Internet Access, Workstations, Babysitting, Beauty Parlour / Hair Salon, Car Hire Service, Currency Exchange, Doctor-on-call, Express Laundry / Dry Cleaning, Florist, Golf & Horse Riding on Request, Safe Deposit Lockers, Travel Assistance.